June 11, 2015 June 12, 2015 / Josh Dragon, P.E. How much does a premium latte actually costs the neighborhood shop down the street to make? What about that national chain of coffee shops we all know and love? Most of us probably don’t want to know the answer to that question. We might find out just how much money we are giving away each year. As we have seen, there are a lot of different costs we might be talking about. These include fixed costs and variable costs. Buried in those are even more costs that our accountant friends love to talk about. A person can get rather dizzy trying to sift through all the different ways a company can look at its costs. At the end of the day though, there is only really one number that anyone cares about. The good old bottom line, net profit. After we have paid every single one of our costs, how much is left over? That is truly the money question. So back to that cup of coffee. How much do you think it costs to make a Grande Nonfat Decaf Gingerbread Latte? My guess is that after all the costs are paid, there is a good chunk of bread left over. For the sake of argument though, let’s assume that $4.50 latte generates $1.25 in net profit. That would be a 27.8% profit margin! How could a company possibly get people to pay those kinds of prices on a low cost item? The easiest way to sell something is based on price. It does not take an MBA, or even a college degree to sell on price. You simply find the lowest price point in the market and undercut it by 5%. Done. To sell a product based on a value proposition is much, much harder. You have to first understand what your customers actually value (if they even know themselves). Then you have to create that value. You have to actually create something that is quality. Finally, you have to communicate that value to your customers. Which again, is even harder if they don’t understand what is valuable themselves. If you can actually find a way to accomplish all of that, you get to charge a premium for that product or service. And you should. That is what the coffee shops do. They sell based on value. They often don’t even say what that value is. 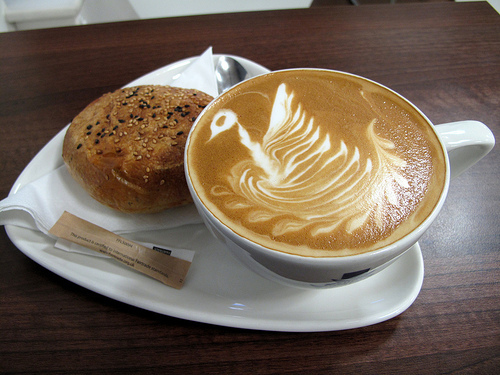 For many of us the value is in the cup, the ambiance, or the latte art floating on the top. It’s that smiling Barista that greats us every morning. We don’t buy that cup of coffee because someone clearly articulated its incredible quality. We buy it because it makes us feel good. I believe a company’s primary responsibility is to generate profit for the shareholders. I also believe companies should seek to create economic wealth for all of society by being highly profitable. There are many ways companies can create social wealth. One is to reinvest the profit made at the end of the year back into the company so it can continue to grow. This leads to more jobs and more economic wealth. The opposite of a vicious cycle. The ethical dilemma for senior leadership is how to spend the profit. Some companies choose to create profit sharing programs for their employees. Others choose to construct new facilities and develop new products in order to strengthen their business. Others decide to spend the profit on corporate jets and penthouses. In the end it doesn’t change the fact that society benefits when companies are highly profitable. The best companies use that money wisely. Others squander it. But we will save those discussions for another day. What do you think? I would love to hear your thoughts in the comments below.